From initial bid to project wrap, the Urban team is by your side. We specialize in large commercial and residential complexes and buildings. Our teams run efficiently at scale, and we coordinate tasks seamlessly to deliver your project on time and on budget. One of our hallmarks is our attention to detail on every front: scheduling, communications, safety, and execution. We’re customer-friendly, too: We keep you updated with emails, off- and on-site meetings, even notices posted on doors. We will shift our schedules to accommodate yours, working nights and weekends as needed. Whatever the challenge, bring it on: We are built for projects like this. Painting is the easy part. Easy access to the project team, whenever you need it. These are our daily practices, all designed to deliver a superior result and your complete satisfaction. Want to make sure we’re as good as we say we are? We’re happy to provide references. Or give us a call and we’ll meet at a job site so you can see us in action. 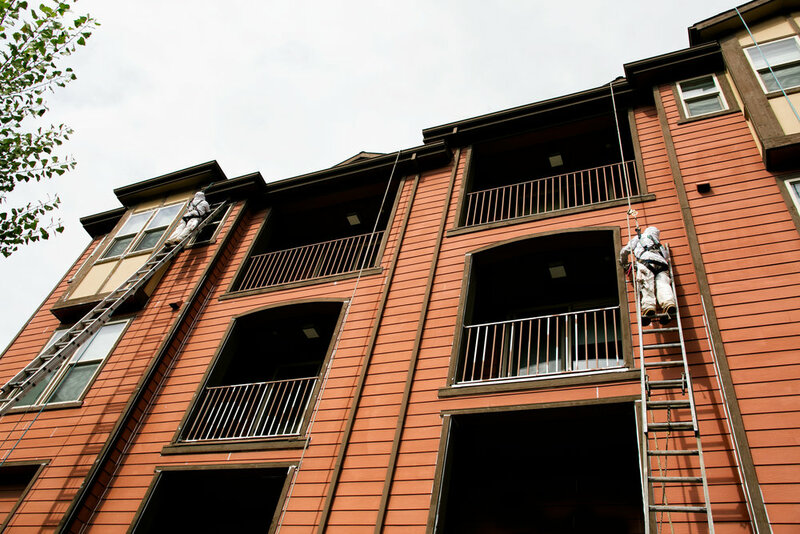 Over the span of three decades, we’ve painted every type of large commercial and residential building – days hot and cold, perched on hillsides, walking I-beams and hanging over lagoons. If problems arise, we handle them immediately.